NP-F550 is the smallest battery in the F550 F750 F960 series of batteries. Most sony cameras and camcorders come with F330 which is exact same size as F550 but much less capacity. Cameras can only use F550 while camcorders can use F750 and F960 thus enhancing the runtime to 4 and 6-8 hours accordingly. For camera users - F550 is a must have instead of the Sony F330. With the same size it outlasts F330 almost twice. For camcorder users - F750 is the best size and runtime choice. Just twice thicker than F550 it runs for 4 hours which is enough for most filming. If you intend to film more than 3-4 hours, then F960 is the choice for you. 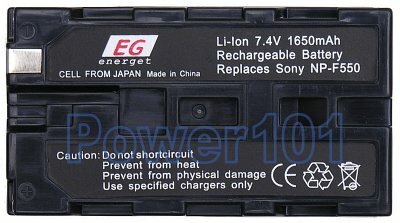 This battery is compatible with many cameras and camcorders. Such cameras are Sony Mavica MVC-FD7, MVC-FD73, MVC-FD75, MVC-FD100, MVC-FD200 and many others. Such camcorders are Sony HDR-FX1, DCR-VX2000, DCR-VX2100, CCD-TRV58, CCD-TRV68 and many others. Please use our camera / camcorder battery finder to check which battery you need. These batteries fully support the INFO technology Sony relies on to display the battery usage. They can also be charged by any standard charger compatible with F-series (F550 F750 or F960), plus they can be charged directly on the camcorder.